Dr David Grimes: Why is smoking more dangerous for the poorest in society? Why is smoking more dangerous for the poorest in society? We know that cigarette smoking causes lung cancer. What we do not usually know is that the poorest socio economic groups are worst affected. Does Vitamin D hold the answer? If you are poor, smoking is dangerous! Another burden for the poorest people in our society. Things are not always quite so simple as they first appear. A study from Denmark, the Copenhagen Men's Study, looked at among many other things the number of deaths from lung cancer, the analysis taking account of social class of those who died. The subjects of this long-term survey were divided into just three simple social groups - low, medium, and high social class, and they were followed up for 17 years. The outcome was very different depending on social class, more so than might have been expected. Those in the highest social class had the best outcome, that is the lowest incidence of lung cancer. Those in the lowest social class had the worst outcome, the highest incidence of lung cancer. Those in the intermediate social group had the intermediate incidence of lung cancer. There was no difference in the number cigarettes smoked in the three groups, nor was there any difference in inhalation. We can see in the figure the cumulative incidence of lung cancer in the three groups, low social group in the highest incidence line. This might not surprise us, as we are now accustomed to hearing that the poor, socio-economically disadvantaged, have the worst health and the shortest lives, at least in northern Europe and the USA. But this social class effect is to my mind astounding. 1.6% of the smokers in the high social class developed lung cancer. 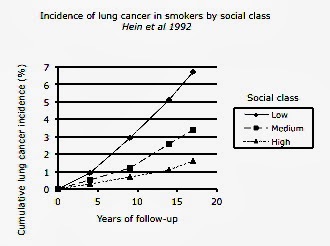 6.7 %, four times as many in the low social class developed lung cancer, a huge difference. 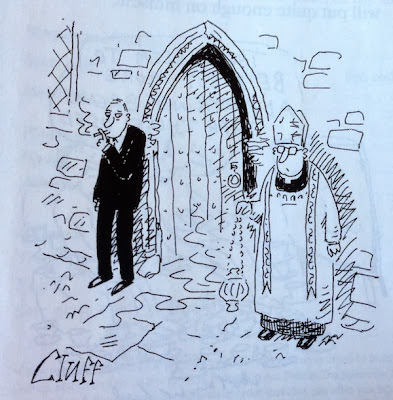 How low social class and poverty translate into poor health is usually difficult to understand, unless we enter into dubious victim blaming, something that defies biological plausibility. But in this case there is not accepted biological plausibility to explain this big difference. Unless, that is, we consider the fact that poor low social class groups have the lowest exposure to the sun and the lowest vitamin D levels, for a variety of reasons based on disposable income, housing, leisure opportunities. I suggest that differential levels of sun exposure probably explain this huge difference in lung cancer rates. Vitamin D, by stimulating immunity, reduces cancer risk and improves survival. There are more observations of lung cancer risk that involve the sun and I will bring these to attention in future posts, shortly. Hein HO, Suadicani P, Gyntelberg F. Lung cancer risk and social class. The Copenhagan Male Study – 17 year follow up. Dan Med Bull 1992; 39:173-176. Please note that smoking is now banned in public places in many countries.